I am not usually excited about making recipes that have a big piece of meat as the star of the show, but for some reason this pork loin and squash recipe really caught my eye. I saw it in the November issue of Everyday Food and both parts look amazing. The caramelized squash just looked so delicious and the spice combination sounded perfect for the pork. I used a smaller pork loin than the recipe called for and for that reason, did away with one of the steps, which I noted in the recipe below. The squash was so tender and delicious, it was simply amazing. The best acorn squash I have ever had. The pork was an absolute hit. My hubby declared it the best meat he has ever tasted and my kids went crazy for it. The perfect combination. Plus, I had enough pork and squash leftovers to make 2 other meals later in the week. That was even better. You must try this recipe, I promise you will love it. Preheat oven to 425. In a large bowl, stir together 3 tablespoons oil, sugar, chile powder, cinnamon, cumin, and 2 tablespoons water. Add squash and toss to coat. Set aside. 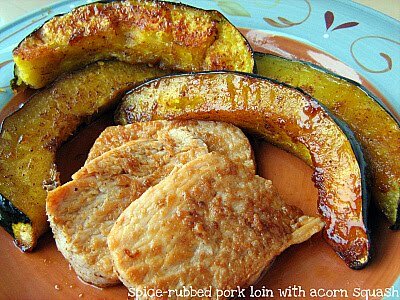 Arrange squash around pork. Brush pork with sugar mixture from bowl. Bake until pork is cooked through (an instant-read thermometer inserted in center should register 135 degrees), 40 to 45 minutes, brushing meat with sugar mixture and turning squash every 15 minutes. Tent pork with foil and let rest 10 minutes before slicing. I decided to do the Bonus recipe for MSC (Martha Stewart's Cupcakes Club) yesterday morning. I made 1/4 of the recipe and I got 6 cupcakes. I would have to say these turned out more like muffins because I decided to use whole wheat flour and they already had applesauce in them. I upped the spices and instead of adding toasted pecans at the end to the batter, I decided to add gingersnap cookie crumbs that were leftover from the Pumpkin Pie Cheesecake that I made for Thanksgiving. I also skipped the frosting because I was going for a muffin type breakfast item. I just dusted them with a little bit of powdered sugar. My sister was very happy about these cupcake/muffins and they did seem a healthier than a normal cupcake. I hope everyone had a great weekend. I have really enjoyed spending some time with my sister and my family. We have had tons of Thanksgiving foods and just enjoyed a long weekend together. 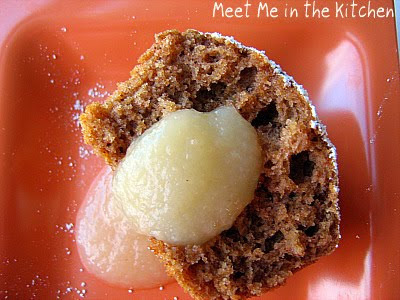 This recipe is one that I have made several times, the first time I made it to send with my younger brother and my son in their lunches last year. Those of us who were able to sample it at home, loved it. It is really easy to make and is supposed to be served cold. The sauce only has 5 ingredients, so you can whip it up in no time. I always use whole wheat angel hair pasta when I make this and then it feels like it is just a little bit healthier for you. 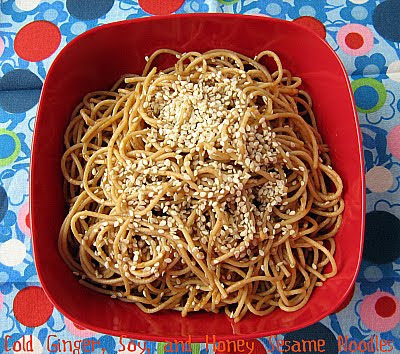 The flavors of the sauce are really delicious- honey, sesame oil, peanut butter, fresh ginger and tamari (which is just a thicker, darker and a little bit richer soy sauce). Yum. This week's CEiMB recipe was a free choice. We were given the opportunity to choose any recipe we wanted to try, although we were encouraged to make something we could bring to Thanksgiving dinner. I decided to try this really simple salad because I have been wanting to try things that have radishes as a main ingredient. I didn't share this at Thanksgiving, but I thought it was a pretty, yummy salad. 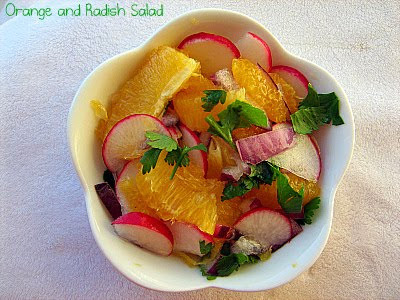 The sweetness of the oranges and the spicy hot of the radishes was really good together. I didn't really get the whole effect of the salad, because I didn't use fresh mint, but I used fresh parsley instead. I think the mint would add a nice kick to this salad. I hope that everyone is having a great holiday weekend. Make sure you check out the CEiMB Blogroll to see what everyone else decided to try this week! This is my last recommendation for your Thanksgiving meal. I saw this recipe in a recent issue of Bon Appetit Magazine and the picture left me with no excuse not to make this sorbet. I love cranberries. I started hoarding bags of them weeks ago, as soon as they appeared in my local Publix. I love how tart they are and their bright red color. They are so beautiful and good for you. I really don't think that cranberries get the attention that they deserve. Anyway, I thought that the combination of cranberries and vanilla was very interesting and definitely something I would never have thought to combine. 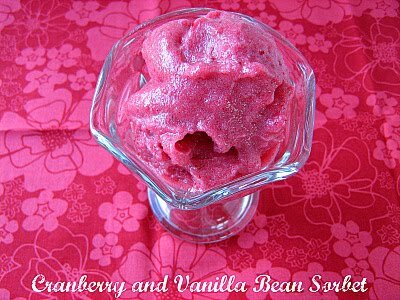 The great thing about sorbets is that they are quick and easy to make. This one basically just combines all the ingredients and cooks them over the stove and then when the mixture has cooled you puree it in the food processor and then churn it in your ice cream maker. I reduced the sugar by about 1/4 cup. I love what Bon Appetit had to say about this sorbet- "Here's a clean, bright dessert that makes a great finish to any meal and can be prepared days ahead. 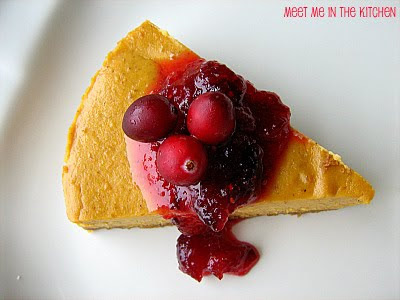 Plus, who knew that mellow vanilla would go so beautifully with tangy cranberries?" 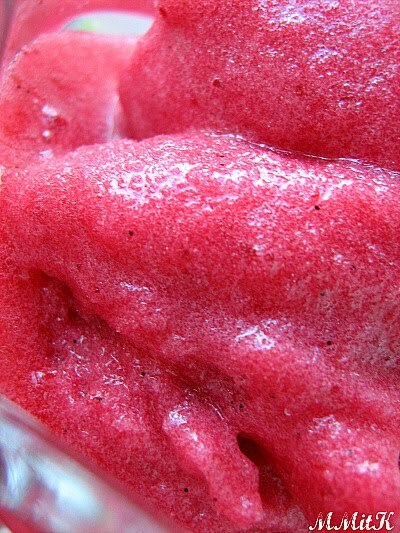 I really think the words clean and bright are great ways to describe this sorbet. It would be the perfect ending to a Thanksgiving meal. Light and delicious. Tangy and sweet. My girls, who are 5 and almost 3, loved, loved, loved this sorbet. *note- the recipe says to strain out the cranberry-vanilla bean mixture before you churn it, but I opted not to do this. I like seeds and skins and they really were not that noticeable in this sorbet. 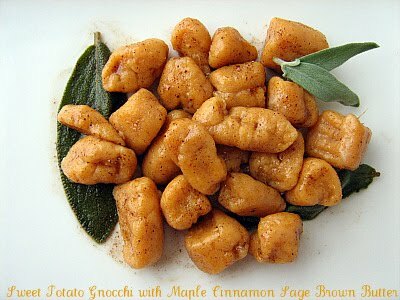 I had to get to this last Thanksgiving side dish today- Sweet Potato Gnocchi with Maple Cinnamon Sage Brown Butter. I never watch tv, especially during the day. For some odd reason, one day my kids wanted to watch something and I flipped by the Food Network. I saw that Giada was making some side dishes for Thanksgiving and we decided to watch for a little bit. I saw her whip up this gnocchi and I was astonished because it really seemed like it took her a few minutes to get it ready. I realize that since it was tv, they edited out some of the steps, but it really didn't take long. 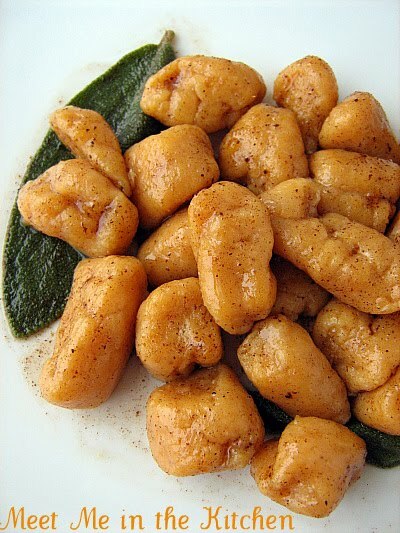 My kids told me they wanted me to make this gnocchi. I had some sweet potato puree left from when I roasted sweet potatoes awhile ago and I had recently defrosted it for the Candied Sweet Potato Cupcakes. 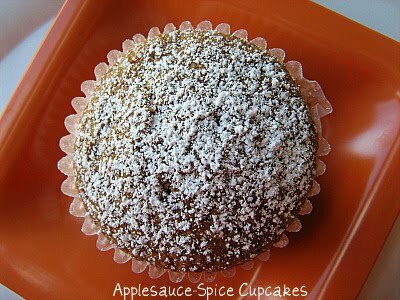 I didn't use all of the sweet potato puree for the cupcakes and I thought this would be a great way to use up the sweet potato puree I had left. It really wasn't too difficult to mix the gnocchi together. 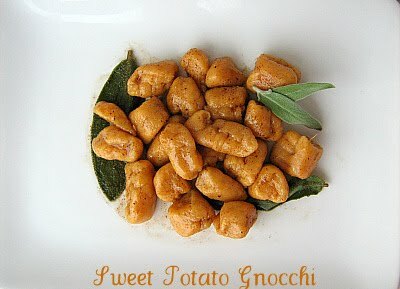 You just add whole milk ricotta, cinnamon, salt and pepper to the sweet potato puree. Then you add flour, a little bit at a time, until you get the right consistency. That was the hardest part for me, is knowing when the gnocchi dough was the ready. I didn't want to add too much flour, but also didn't want to add too little. 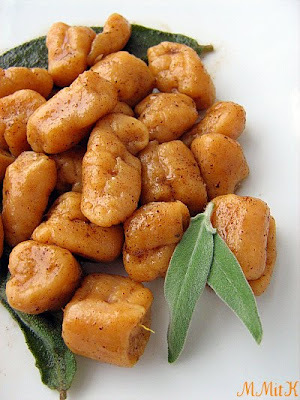 I am sure this is something you learn the more you make gnocchi. The next step is dividing the dough and rolling it out into a long, snake-like rope. When I saw Giada do this, I couldn't help but think about play-doh. Then you have to shape the gnocchi. My first batch were too big and wide, they tasted good, but looked horrible. The second batch were the right size, but I cooked them too long, so they were mushy. Finally, on the third batch I got it right. The shape was ok- not too big and not too small, and I cooked them just the right amount of time. So, my analysis is, that they more you make gnocchi, the easier it becomes. The sauce, is butter, which you brown and then you add whole sage leaves, cinnamon and pure maple syrup. I wasn't really expecting my kids to like this dish. I made it purely out of curiousity for myself, well, and partly because my kids said they wanted me to make it, but they say that about almost everything. I guess since my kids saw the tv episode where Giada made this, they were very interested in trying it. They all loved it. I barely even got to have any, because they were scarfing it down. 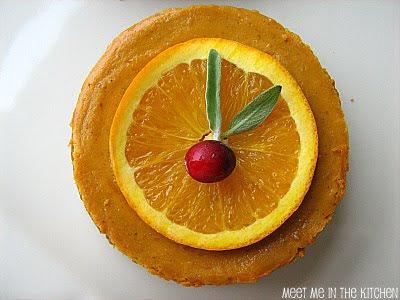 I think this would be a really good way to serve sweet potatoes for Thanksgiving, with a twist. Pumpkin Pie and Cheesecake. Together as one. Brilliant. I was going to post the two desserts that I made ahead of time for Thanksgiving in the same post, but I took way too many pictures of this cheesecake and they turned out pretty good, so it gets its own post. I saw this recipe in Better Homes and Gardens Magazine and the picture was just so gorgeous, plus it sounded delicious, so I made it right away. I didn't know what I was going to do with an entire cheesecake though, so I divided the recipe into 5ths (since there were 5 eggs and I didn't want to half an egg) and then doubled the 1/5th, so I made 2/5ths of the recipe. (Sounds more confusing than it was). I made 4 mini cheesecakes with my 3 or 4-inch springform pans. I had to taste a tiny bit and then I took them to my hubby's work where they were a hit. The thing that really got me excited about this dessert is the fact that it really doesn't have a million calories or a trillion grams of fat in it, because most of the filling is pumpkin puree. That seems very unusual for a cheesecake type dessert that doesn't claim to be low-fat. Anyway, you probably think I don't care about calories and fat because I make so much dessert, but I do. I am a healthy eater that loves to bake. Anyway, enough about all that boring nutrition information. You must make this dessert. The crust is made up of gingersnap crumbs with a little bit of brown sugar. The texture is amazing. 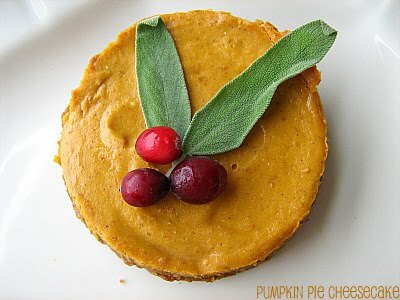 It has the flavor of pumpkin pie, but the filling is so smooth and light. 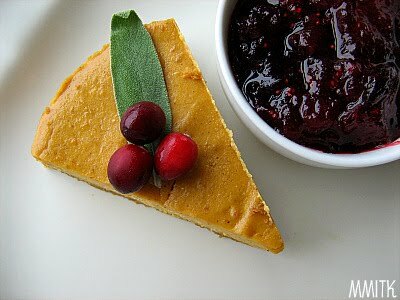 It is the texture of cheesecake with the flavor of pumpkin pie. It is perfect. The cranberry topping is amazing with it. If you crave pumpkin and cranberry together, this is your dessert. 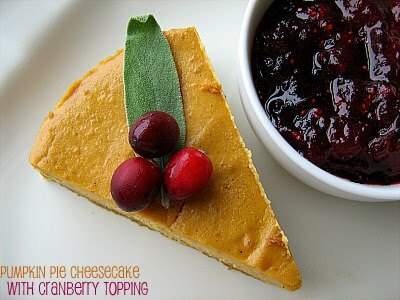 The cheesecake isn't overly sweet, but with the tart cranberry sauce it is magnificent. 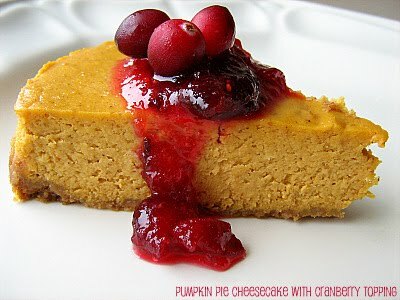 I am making a full-sized Pumpkin Pie Cheesecake for Thanksgiving. You should too. So here is one of the Thanksgiving desserts I wanted to try out before hand to see if it was worthy of making it to the big meal. 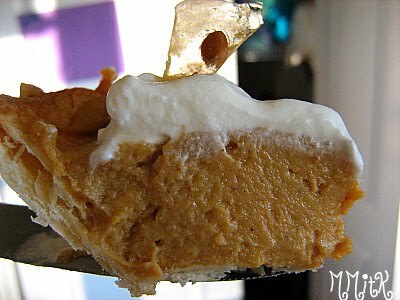 I love pumpkin pie, plain and simple, but I wanted to try a couple of other desserts that played around with the pumpkin and the pie, and presented it with a little twist. 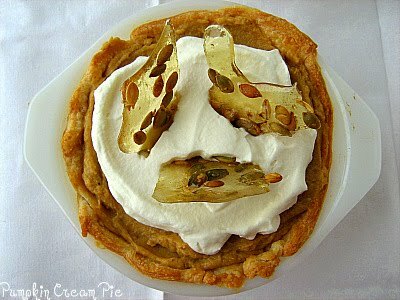 This pie is made with a basic pie crust, and then filled with a pumpkin flavored pastry cream. Pastry Cream has the texture of a thick pudding and I have to say that this was a really delicious one. I made 1/2 of the pastry cream and decided I was going to make mini pies. I made a bunch of mini pie crusts in my muffin tin, you just cut out circles of pie crust with a cookie cutter and bake them for about 10 minutes- watch them close so they don't burn. I made 6 minis and then baked up the rest of my pie crust in small (about 4-in) dishes. The chilled pastry cream is scooped into the pie crust and chilled in the fridge for a few hours or overnight. 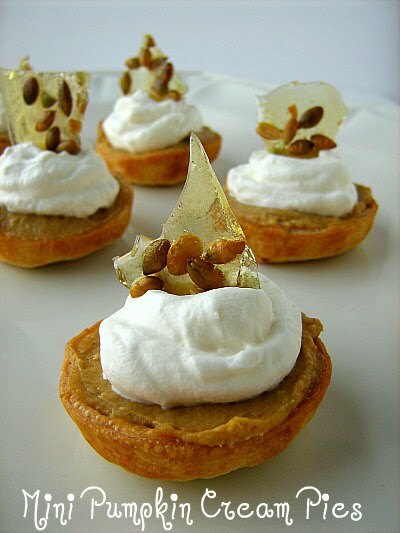 Then it is topped with sweetened whipped cream and candied pepitas. This has all the same flavors as traditional pumpkin pie, but the pastry cream is much smoother than a normal pumpkin pie filling. 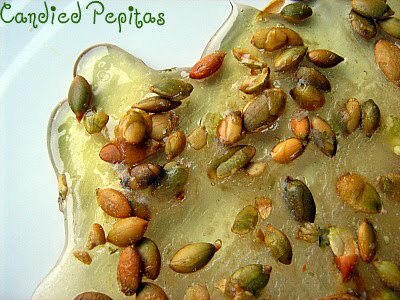 The candied pepitas add a nice little crunch. I used roasted, salted pepitas in my candy and really like the little bit of savory that added to the super sweet candy. This pie is perfect for Thanksgiving. I definitely think it would keep traditional pumpkin pie lovers happy and also has just a little bit extra to get other people excited too. Yum. *note- the recipe says that the pastry cream takes 10-15 minutes to thicken up and boil, but mine was ready in 2-3 minutes. Don't overcook it, as soon as it is thick, it is ready. Let me just start out this post by saying that I do not enjoy frying foods at home. I rarely ever do it. And even when I do fry things, I use just a tiny bit of oil. 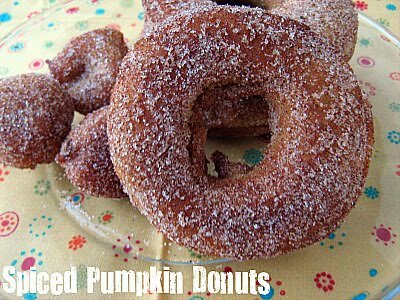 I saw these Spiced Pumpkin Donuts in, (surprise! ), a holiday baking magazine and loved the fact that the dough was very simple to mix together- there was no yeast involved, and was interested in a pumpkin flavored donut. I mixed up the donut dough/batter the night before I wanted to fry the donuts because it had to rest for at least 3 hours in the fridge, so I figured why not overnight? I decided to make them on a school morning, so I had to get up a little earlier than usual to get them done. It was the day that I was taking my mom back to the airport. It also happened to be my son's teacher's birthday. He wanted to take her something, so he ended up bringing her a warm donut. Like I mentioned before, you mix up the no-yeast-involved dough and let it rest in the fridge for couple of hours. Then you roll out the dough, but it into donut shapes and fry them for a few minutes on each side. Then they are rolled in a spiced sugar mixture. I let my kids each have one, my son took one to school for his teacher and my hubby took the leftovers to work. 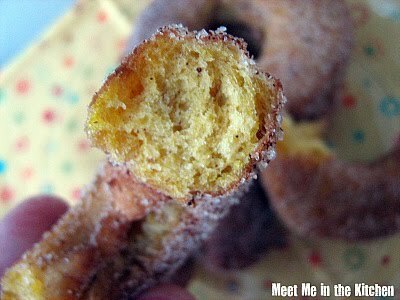 The flavor was good and the spiced sugar was really tasty on these donuts. When I went to fry them, I only had a tiny bit of canola oil, so I barely had enough oil to cover the bottom of the pan I was using. I was scared that the donuts wouldn't puff up or cook because I didn't have enough oil, but they still came out just right. 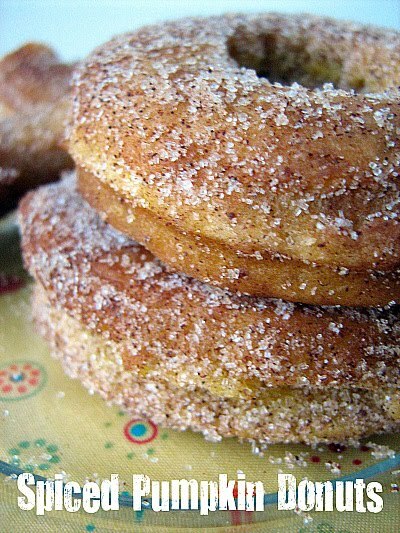 If you have a special occasion over the holidays or want to make a special breakfast, these donuts would be a perfect addition! I have really tried not to buy every Holiday Baking Magazine that I see. I have been successful! There have been a couple that I couldn't resist, but at least I am making some of the recipes out of them, so it hasn't been a waste of money. I saw this Cranberry-Pecan Bread (the recipe originally used walnuts, but I think pecans are better, so I subbed them in) and thought it would be a fun recipe to try. 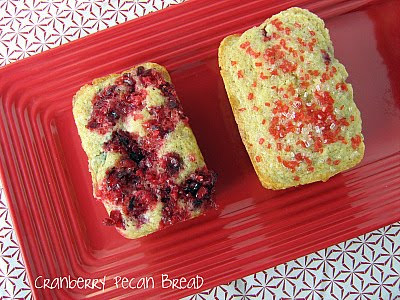 A basic quick bread with a hint of orange, cranberries and toasted pecans. Perfect for the holidays. Of course, everything is easier to share when you make it into minis. I halved the recipe and it made 5 mini loaves. The recipe says to top the bread with a chopped cranberry/sugar topping, but I was a bit skeptical as to how it would stay on top of the bread, so topped half of the mini loaves with decorating sugar and half with the cranberry/sugar topping before I baked them. I also reduced the sugar by about 1/4 cup and have been doing that lately in most recipes I bake, because it seems like it doesn't really affect the taste that much to leave out some of the sugar. When I took out the loaves, I realized that the cranberry topping made the tops of some of the loaves sink a bit, so that is probably why the topping was supposed to be put on after baking. Oh well, I guess that is how you learn, right? The ones with only the sugar topping was done at 20 minutes. The others took a couple minutes more. My kids really loved this bread. I also gave a couple of these away, so this would be a good food gift for this time of year. Preheat the oven to 350 degrees F; coat a 9x5-inch loaf pan with nonstick spray. Whisk together flour and next 5 ingredients in a bowl; make a well in the center. Set dry ingredients aside. 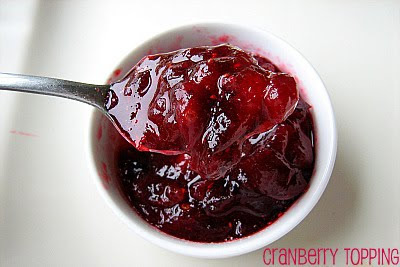 Toss 1 1/4 cups cranberries with 1/4 cup granulated sugar in a small bowl; set sugared cranberries aside. Whisk together buttermilk, the remaining 3/4 cup granulated sugar, eggs, oil, zest, and vanilla in a separate bowl until fully combined. Pour buttermilk mixture into well of dry ingredients; stir only until dry ingredients are moistened. Stir the sugared cranberries and pecans into the batter. Pour batter in the prepared pan. Bake until a toothpick inserted in the center comes out clean and bread is golden on top, about an hour. Cool in pan on a rack for 15 minutes. Pulse the remaining 1/4 cup cranberries in a mini food processor (or mince them by hand); toss with coarse sugar for the topping. 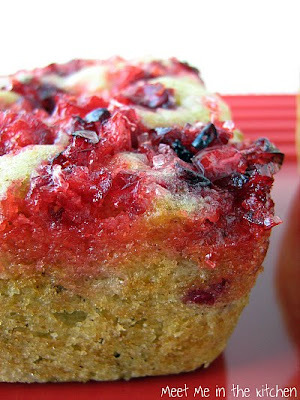 Turn bread out onto cooling rack; sprinkle top of loaf with the cranberry-sugar topping. Let bread cool completely before serving. When I was narrowing down all the recipes I wanted to try out before Thanksgiving, I saw these two different takes on stuffing/dressing that both contain butternut squash. I love butternut squash. I think it has the perfect texture and flavor and could turn a squash-hater into a squash lover. The first recipe is called Butternut Squash and Cheese Panade. (What is panade? Check out this link or this one for more info) I used a multigrain sourdough bread to make my bread crumbs and made enough for the other recipe that I was going to make later. I also roasted a lot of butternut squash and onions with the herbs, so I would have enough for the other stuffing. This panade is super simple. 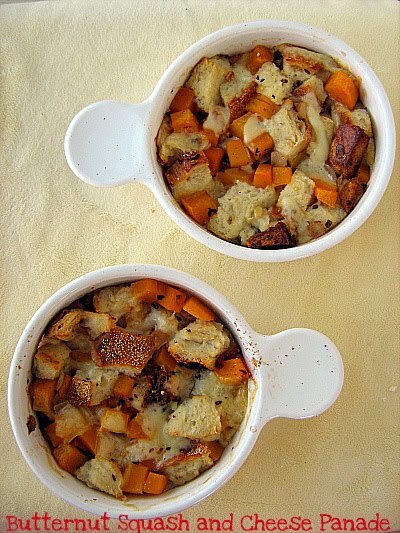 You layer your bread cubes, butternut squash/onion/herb mixture and cheese. (I used swiss.) Then you pour in the chicken broth, which is soaked up by the bread and bake it until it is golden and the bread is puffed. I thought this was really good. Very tasty combination of flavors. 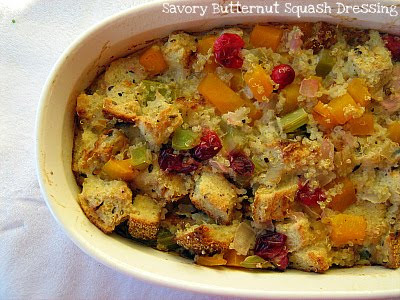 The second stuffing/dressing was Savory Butternut Squash Dressing. I found this recipe in Better Homes and Gardens Magazine. I changed a lot of things about this recipe, mainly because I already had my butternut squash roasted. I also had cooked quinoa in my fridge so I decided to use that instead of the wild rice called for. I also left out the dried cranberries. I sauteed my onion, celery and fresh cranberries in a little bit of oil and then mixed up the egg mixture. I threw in some cooked quinoa and my toasted bread cubes and then put it in the oven to bake. 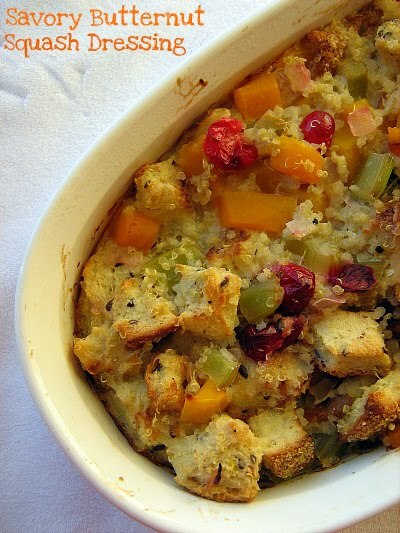 I liked this recipe better, but I think it is because it had more of the traditional "stuffing" texture that I am used to. I really didn't follow the recipe that closely though. I kind of did my own thing. 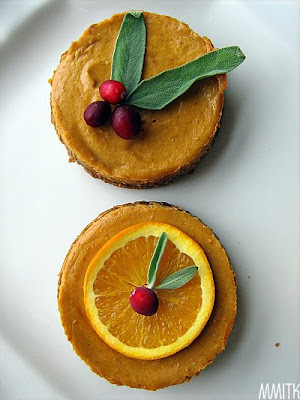 I really like how both of these recipes incorporate butternut squash into the stuffings/dressings. I am all about having more nutrition and vegetables at Thanksgiving, so however I can get them in, I will try it. 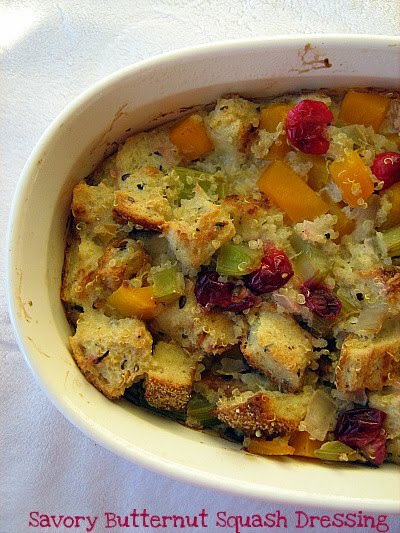 Do you have a favorite stuffing/dressing? 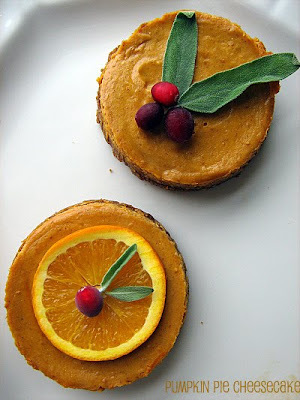 Here are 2 more recipes that would make a great addition to your Thanksgiving Day Menu. Both of these salad recipes were featured in the November issue of Better Homes and Gardens Magazine. I decided to make the Pear and Arugula Salad because I love arugula and thought the flavors would be great together. Arugula has a nice peppery bite to it, which I absolutely love. 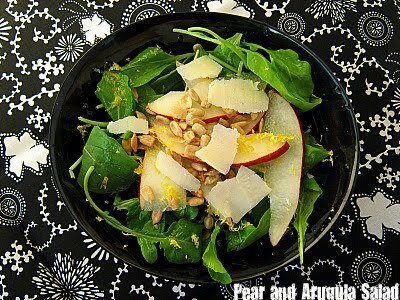 The red pear, sunflower seeds, parmesan cheese and delicious, light lemon dressing really made this a refreshing salad. Sometimes the traditional Thanksgiving dishes are so heavy, that I think a nice, light salad would really brighten up the table and add some much needed green to the menu. 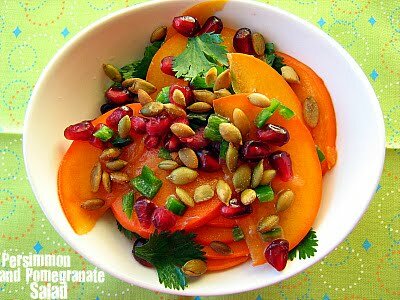 The Persimmon and Pomegranate Salad was just too interesting to pass up. I have noticed persimmons the past couple times I have gone to the grocery store, but until I saw this recipe, I really had no idea what to do with one. My kids love pomegranates, so we have been munching on the arils quite a bit already this fall, and the ones at the grocery store right now are beautiful-so large and bright red. I forgot to pick up pine nuts, so I just subbed in roasted pepitas (pumpkin seeds). This salad has a nice kick from the jalapeno and the lime juice really brings all the flavors together. Persimmons are really tasty and so beautiful when you slice them. Be brave and try this salad, you might really love it!